I recently received a note from a property owner who lives outside of Tallahassee. The home that she owns in Tallahassee is currently leased to a tenant, and she's trying to decide whether to sell the home or move back into it. As there are many people in her current situation who chose to lease a home when they could not get it sold, I figured this would make an excellent topic for a blog post. When I first saw this question this morning, my immediate thought was that there were several questions really being asked here, and two unsubstantiated assumptions. The question is not so simple that I can just give her a sell versus lease versus occupy response. Therefore, I have broken down LM's question into three separate questions in order to provide a thorough response. 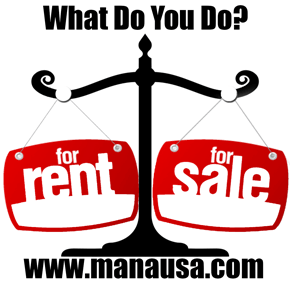 What To Do With An Investment Property In Tallahassee? The short answer on this is "it depends." There are too many variables for me to provide a blanket answer that covers everybody's unique situation, so let me just recommend that to find the answer to this, I would need to know where the property is located, what the supply and demand for similar homes looks like, and just how motivated the owner is to be rid of the home. Everybody has a different tolerance for landlording, and this is something I would need to know before providing an answer. Is Spring 2015 The Best Time To Place Your Home For Sale? I have found that many people think the best time of year to enter the housing market as a seller is in the Spring, but this is simply not true. It just so happens that many people enter in the Spring to make their move coincide with the end of the school year. With so many people listing their homes for sale in the Spring means that supply rises each year at that time. As does demand. So the odds of selling a home are not any better, the market is just more active with both buyers and sellers. To test for the "best time of year to list a home for sale," I did a study and found (at that time) that November was the best time of year for home sellers, where the supply and demand balance more often favored the seller. Of course, our reader might be waiting for Spring because of the term of the current lease, but that was not stated. So my answer to this question is that no, Spring is not the best time of year to sell a home in Tallahassee, but Spring might be a better time for our reader if that coincides with the termination of his tenant's lease. Should You Relocate To Tallahassee For Tax Advantages? I have three answers to this question, and each is based upon a different bias. My first answer is that you should seek tax advice from a CPA, as I am merely a real estate broker (the bias on this answer is a legal one :)). My second answer is "heck yeah, relocate to Tallahassee." My bias on this is from the standpoint of somebody who is financially tied to the success of the Tallahassee real estate market, and we need more residents here to consume the glut of homes on the market. But my third answer is the one "LM" should consider above all others. I do not think you should allow a home to dictate where you live. Go live where you will be happiest, do not simply default to Tallahassee because you own a home here. We can get the home sold if that is what needs to be done. Even if you think Tallahassee is the best spot for you, is this the right home for you now? Choose where you want to go, and solve your housing problem independently from that decision. Life is short, enjoy it to your fullest capability. Whether you live in the home or not, now is a good time to evaluate whether or not it is time to sell. For this reason, we have established a property valuation service, where we will give you an accurate valuation of your home ... no strings attached! If you would like to know the value of your home, simply drop me a note and let me know where the home is located.